Modern technology and the special Lead alloy used classify CARANDA Magic Truck® accumulators in the “completely maintenance free” class. The water consumption is extremely low, the self-discharge is reduced and the corrosion resistance of the battery components is very high. These accumulators use double separators with fiberglass mat. The plates are reinforced by the use of special resin, which substantially increases the vibration resistance. The risk of explosion is minimized due to a lid equipped with a flame arrester of the “flame arrestor” type. These batteries are suitable for use on heavy vehicles with multiple on-board equipment and that require a longer service life. 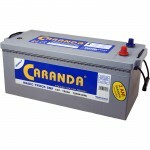 Baterie camioane 150Ah 1000A - CARANDA MAGIC TRUCK. Acumulator pentru camioane, TIR, vehicule grele industriale. Rezistenta sporita la vibratii.